I attended a professional meeting today where I am certain I heard the sentence, "If you are waiting for the bottom of the real estate market in New York, you missed it." That is pretty close to the truth based on first hand experience. The good news is the uptick in activity is happening at the lower end of our market. That is, more lower and middle income people are buying first homes. The first time home buyer's tax credit is a wonderful incentive and a no-brainer if you were even thinking about buying property. Be aware however, in order to qualify, you must close on the property by December 1, 2009. There is no guarantee the deadline will be extended. The additional good news is the luxury market is still a little soft and you can find some incredible properties; Adirondack lake front great camps, for example, at decent prices. We also heard about a pretty nifty new program at our real estate people meeting today. The Adirondack Community Housing Trust is a home ownership program based on the Community Land Trust model. I like the mission: "Homeownership in the Adirondacks is being priced out of reach for local working families. ACHT was created to keep a selection of Adirondack Park homes affordable for them to purchase." Feel free to contact me if you'd more information on these topics. 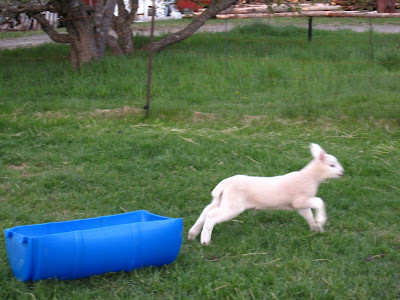 Today's featured photo is one of my Gutmann lamb friends from the archives. Adirondack Sea Monster or South American Expat?